Sound Eye and Laser is the only downtown Seattle LASIK facility to have our own licensed and certified Ambulatory Surgery Center, meaning we can not only assess your candidacy for a LASIK procedure, but we can perform the procedure on-site. Our goal is to provide our patients a comfortable, familiar environment and free you from the stress of traveling to a different location. Our certified surgery center meets the highest standards set for all types of ophthalmic procedures. Aside from offering refractive procedures such as LASIK, we treat a broad range of eye conditions like glaucoma, cataracts, and eyelid surgery. Our optical department is full-service and can provide you with the latest technologies and fashions in lenses and frames as well as contact lenses. With the rising costs of healthcare in the United States, it’s important that you get quality vision care in an economical way. We accept all major insurances and Medicare and we’re a member of Vision Service Plan. If you’re unsure about your benefits, complete this form and we can easily check for you. We also offer 0% financing through CareCredit for refractive surgery and some other procedures, and accept Flexible Spending Accounts. Check with your employer to see if this benefit is available to you. 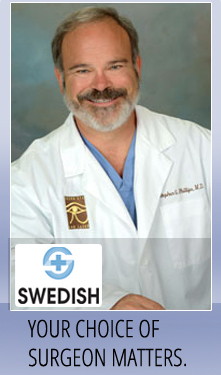 Our surgeon, Dr. Stephen G. Phillips, M.D., has been practicing ophthalmology in Seattle for over 25 years. In 1992, he added refractive services to his medical and surgical practice and has been on the forefront of LASIK procedures, practices, and technology ever since. He’s performed countless refractive procedures over the years and his clientele includes physicians, dentists, nurses, attorneys, engineers, architects, and other professionals. He’s a member of the American Academy of Ophthalmology, the American Society of Cataract and Refractive Surgery, the Washington State Medical Association, King County Medical Society, and was the past president and recipient of the Distinguished Service Award from the Washington Academy of Eye Physicians and Surgeons. We use one of the most reliable excimer lasers in the world – the Nidek EC-5000 – for all of our PRK and LASIK surgeries. Dr. Phillips also utilizes the Nidek OPD Scan, which provides eye topography, autorefraction, keratometry, and pupilometry and other data to precisely analyze the cornea before surgery. We’re constantly upgrading and updating our facility with the latest technology, ensuring your procedure is of the highest quality. “The best decision I’ve ever made,” “(I) only regret waiting so long to do it,” and “Thanks for improving the quality of my life.” These are just a few of the endless notes of thanks, praise, and recommendation we’ve gotten from our patients over the years. With such a long history of experience, we’ve treated hundreds of patients and we’re used to getting feedback like this. Read more reviews for Dr. Phillips here. To discuss your LASIK candidacy or to schedule an appointment with Sound Eye and Laser, click here.